It takes a lot to think of something new to do within science fiction, but that doesn’t mean the old tropes have been exhausted. Other Space owes influences to many of the shows on this list of the 50 Greatest Sci-Fi TV Shows, but manages to find a unique voice of its own. In fact, it proves you don’t need a big name star or even explosions to succeed — although the name Paul Feig probably doesn’t hurt — he created, directed and produced it. Opening titles tell us that a “multi-national corporate coalition” was formed in the mid-21s century to map the cosmos, and that we’ll be following the adventures of a ship that went missing in 2105. We’re then thrown into action on the bridge of a spaceship, which could be any spaceship on any show. People are frantically shouting for the captain to make a judgment call when he enters with a tray full of hotdogs to share. It’s a ham-handed joke, but tells us all we need to know about central character Stewart. (Karan Soni). Crew morale is his utmost priority and his aw-shucks need to be liked will always trump his professional obligations. And that’s okay, because he’s just passed this simulation (we knew it was a simulation) with flying colors. Stewart gets assigned the ship he’s dreamed of piloting since childhood and a crew of misfits to populate it. Grudgingly at his side is his harder-working, more focused older sister Karen (Bess Rous, who you may not recognize despite having seen her in a lot of stuff). His navigator is his flight school crush, Tina (Milana Vayntrub), who you’ll soon forget is the AT&T girl. Actually, you’ll never watch one of those AT&T commercials the same way again. You’ll see. Of course, there are other losers that include the ship’s AI and a stow-away, smart-mouthed robot. Naturally, things go horribly awry as soon as they take off, and this merry band has to rely on their tenacity and ingenuity to survive. If this sounds like a lot of hackneyed tropes, it is. It hits just the right balance of doing stuff you’ve seen a million times and finding a snarky, unexpected tone with which to deliver it, that it works. There’s a “twist” in the episode, and you’ll probably see it coming. If you’re like me, you’ll laugh anyway. And, by the way, this is one of those pilots that’s even better after you’ve watched the whole series. On rewatching, you’ll notice details of character introduction and appreciate that the show’s creators likely thought through the whole story arc before lift-off. 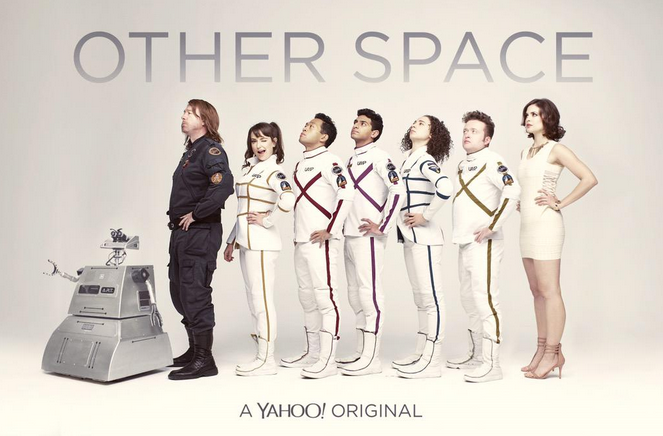 Other Space airs on that Other Internet TV Network, which you may be oblivious to unless you’re a diehard Community fan. (It’s on Yahoo! Screen.) There’s no reason I can think of that this show couldn’t hold its own on Comedy Central, so don’t hold its below-the-radar status against it. In fact, if you like Community, it’s a good bet you’ll like this. This entry was posted in 2010s, Comedies, Web Shows by meekthegeek. Bookmark the permalink.